Finding the perfect gift for a loved one offers the same thrill as searching for treasure. If you know someone that enjoys playing around in the kitchen, then the obvious choice is to grab some new kitchen gear for them. There are so many amazing gadgets and tools available to use in the kitchen, it can be difficult to determine which is best to buy. 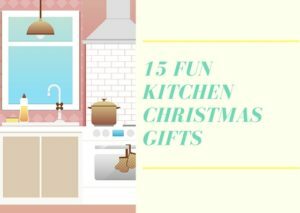 Thankfully, we spotted some fun kitchen Christmas gifts that are under $25 so don’t hold back; now you can purchase a few! Enjoy some fresh pineapple without all the mess of trying to core and cut one! This stainless steel tool isn’t just simple to use but also takes just seconds until you can enjoy that sweet pineapple taste. Use it to cut one slice or the whole pineapple, the choice is yours. The best part is that the shell remains intact which is a fun serving idea at parties. Let your kiddos slice their own bananas with this safe kitchen gadget. In one quick motion, you can have banana slices for your cereal, fruit salad and more. You might think this ingenious tool would only be used by a lazy person, but once you own it, you’ll realize how much you needed it. Never slice a banana the old-fashioned way again. Taco night has been begging for this invention. With one truck colored like salsa and the other as guacamole, you can make any night feel Mexican again. The problem will be trying to hide all the fun you are having while attempting to act like an adult. This would be a great gift for anyone that has kiddos – in fact, for the price; you should grab a few sets. Adding fresh corn on the cob to recipes creates quite the tasty meal. Doing it manually with a knife can be a pain and often messy. Instead, give this corn stripper as a gift because it features durable, stainless steel blades. It gets the job done fast and with less to clean up afterward. I would think after giving this gift you have every right to request some homemade salsa. Any household that has children or some immature adults needs a dinosaur to serve the pasta. The pasta-snagging teeth make serving easy and fun. Plus, who doesn’t want to watch the water drain through a dinosaur nose and eyes? Sounds like some cheap entertainment to me. I am sure there are other foods they’ll find to use this with as well, just for the thrill of it. If you know someone that loves to make decadent goodies from strawberries, this is the perfect gadget for them. Easily hull a strawberry in just seconds while leaving the entire shell intact. That means, it is perfect for filling with chocolate or slicing up for other uses. This tool also allows children to work in the kitchen with mom without the worry of sharp knives. Save your loved ones money and calories by helping them avoid fast food in the morning. This sandwich maker can cook delicious breakfast sandwiches in just 5 minutes. They can use their own fresh ingredients and a variety of bread to make a different offering every day. This is a great gift for someone who is on the go but still wants to eat a breakfast that jump-starts their day. Don’t forget the coffee to go with it! Perfect eggs in no time: quickly prepares both poached eggs or soft, medium and hard-boiled eggs. 7 Egg capacity: make breakfast for the whole family, healthy snacks, Salad toppers, a batch of deviled eggs for a potluck and more. Cooking eggs is no longer a hassle with this invention. Simply place up to 7 eggs in the device for perfectly soft, medium or hard-boiled eggs in a fraction of the time. In addition, there is a handy 3-egg non-stick poaching tray that comes with the cooker. It will be easier than ever to create deviled eggs, salads and breakfast with this ensemble. Everybody loves a good hot dog, especially when it is cooked in this fun toaster. You can place two regular or plump hot dogs in at once as well as two buns. It even comes with a removable cage and mini tongs so fingers don’t get burned. Just imagine your loved one sitting back with their steamy hot dog and a cold glass of soda – how refreshing! Do you know someone that can’t stand soggy cereal? There’s even an invention ideal for them. The slide design of this bowl keeps the cereal crispy with one simple motion. It is a favorite with kids around the world and is sure to be a hit as a gift. The built-in-grip makes it easy to hold even when lying in bed. Don’t worry about making a mess; the deep sides prevent spillage. This mighty gadget allows you to mince garlic to your desired texture without dirtying cutting boards or knives with sticky garlic juice. Simply load the GarlicZoom chamber with garlic, roll the unit back and forth on a smooth surface, and let the interior blades take over. Rolling more will result in a fine mince while less rolling offers a coarser chop. Cooking with garlic adds intense flavor to any dish, but who wants to smell it on their hands for hours later? This powerful tool makes it easy to mince garlic without the need for cutting boards or knives. The compact design makes it easy to store even in small kitchens. The best part is that there will be no more garlic juice to clean up. Usage: You can put a special microwave oven cleaning solution, or a mixture of water and vinegar solution, into the microwave oven, heating and observation, you will find the head look like, when she calm down Cleaning is complete, you can continue to use a rag or sponge to clean up. Add a little lemon liquid can increase the aroma. Microwave Cleaner is a high-quality plastic container . It is specially designed to clean up the Grease and Grime in the microwave oven. You know the old saying, “If momma ain’t happy…” That’s taken to the extreme with this microwave cleaner that is sure to be the talk of the house. Simply use a cleaning solution in the microwave and she will take care of the rest. It will be some free entertainment to enjoy the steam coming out of mama’s head. What a fabulous way to keep the microwave free of food and bacteria. Know someone that enjoys avocados but doesn’t look forward to the preparation? This all-in-one tool will slice, pit and split the avocado is just seconds. What you are left with is seven perfect pieces gently lifted from the skin. Be the first one willing to test out some homemade guacamole with this cool contraption. PROMOTE HEALTHY EATING HABITS! - Portion control ceramic serving bowls so you can eat your favorite food in healthy serving sizes. Enjoy your dessert and favorite carbs like rice, noodle soup and pasta in a mini bowl so you don't have to worry about overeating! PREPARE HEALTHY MEALS WITH EASE! - Uniform portion size takes the guesswork out of meal preparation so you can serve food straight from the freezer or oven. Each portable soup bowl comes with a matching spoon so mixing and eating is hassle-free! Enjoy your onion salad, fruit, miso soup or cereal with ease. This colorful set of bowls and spoons is the perfect gift idea for someone that has it all. The all-in-one set makes it easy to place anywhere as a practical, decorative piece. Everything is also portioned controlled making it the ideal choice for a health-conscious eater. It is the ideal choice for salads, oatmeal, cereal and more. Grilled cheese is a staple of America. It brings us all back to fond childhood memories! Treat a loved one to the gift of perfect grilled cheese sandwiches with this unique toaster. They can create two grilled cheese sandwiches in just minutes and there is little mess to clean up afterward. There is even an adjustable dial so it can be as light or dark as they wish. Yum! With all these fun Kitchen Christmas gifts to choose from, it can be hard deciding which will be the most enjoyable. With the low prices that they are being offered at, it might be wise to stock up on a few. Whether you use them for Christmas or future housewarming and wedding gifts, they are all sure to be the talk of the party.